News — It matters to natter! 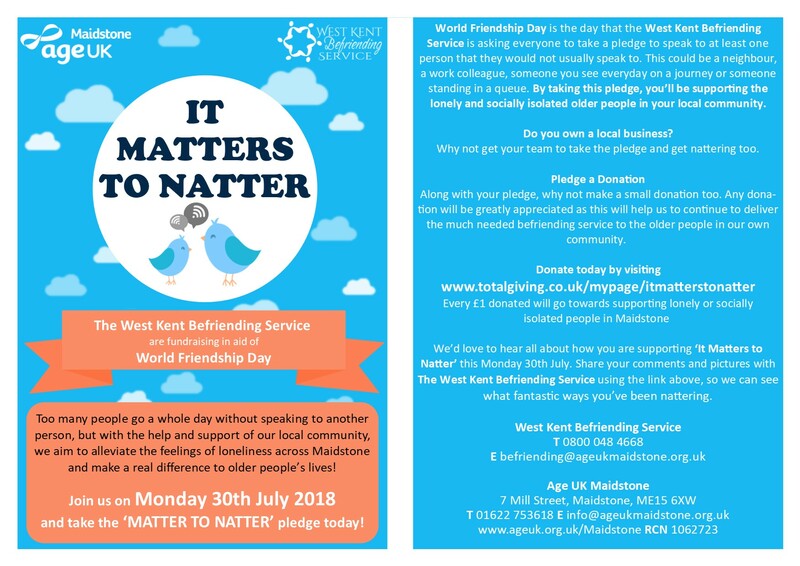 The West Kent Befriending service are fundraising in Aid of World Friendship Day! Too many people go a whole day without speaking to another person, but with the help and support of our local community, we aim to alleviate the feelings of loneliness across Maidstone and make a real difference to older people’s lives! Join on Monday 30th July and take the ‘MATTER to NATTER’ pledge today! Our goal is to raise £1,000 for the West Kent Befriending Service but just as important, if 1000 people get involved and make that pledge, that will also be 1000 conversations that would not ordinarily have taken place…how amazing is that!